God's Growing Garden: BLOGGER OPP - "A Conquered Mess" Turns One! Hi everyone!! I am sooooo excited for my upcoming one year blogiversary!! Wow! I honestly cannot believe it will be one year since I first went live on ACM! It's been quite the journey. I have met some amazing people, and I've learned SO much. I'm very pleased to announce that I will be celebrating my one year mark with a CASH giveaway! I've never done an event this big but so far, everything is shaping up nicely. Not only is this good for my readers, but it is also good for my fellow blogger friends. 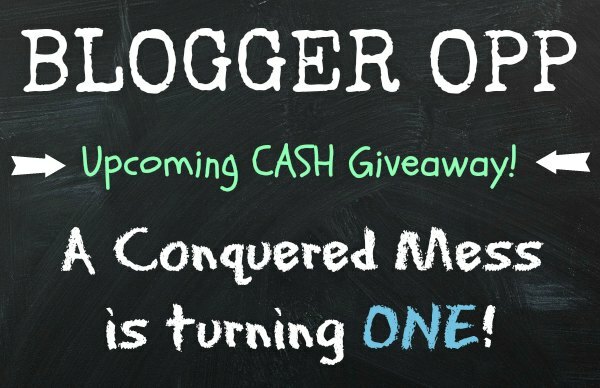 Cash giveaways can bring lots of exposure to your blog so it makes me happy to say that this giveaway is now open for co-hosting and link submissions. As of today the total prize amount is $275 US dollars, but I am hoping to hit the $500 mark by the time registration closes! Fingers crossed. There is NO administrative fees and 100% of the proceeds will be used towards the prize amount. If you would like to purchase links or a co-host spot, prices are as follows: $5 per link $20 for co-hosting (4 links + free blog URL and post code) The only thing I ask is that you PLEASE do not submit Google+ profile links, because those cannot be used in giveaways. Co-hosts will be given a chance to post up this announcement and the one with the most referrals will get a 3 month sponsorship package from ACM, valued at $30, for FREE!! If you are not a co-host but would still like to post the announcement for the chance to get the sponsorship, let me know so I can send you the code. Giveaway will begin on June 11th, so please submit all your links by June 4th. There are only 12 co-host spots left open so hurry quick if you'd like to co-host! Thank you in advance for your support, I'm really looking forward to it! Submit your links using the form below :) READERS: Stay tuned for final prize amount and details!